There are a wealth of options for finding office space in Cambodia. Indeed, it is estimated that new projects next year will bring over 112,000 additional square metres of strata-titled office space to the market. A report from CBRE Cambodia showed that, over the third quarter of this year, office space supply grew by 4.6 percent over the previous quarter. What’s more, occupancy rates also increased by 4.7 percent. As the Kingdom becomes more urban and more technologically connected, startup culture and opportunities for small- and medium-sized enterprises (SMEs) are growing. Many of these local businesses have trouble getting initial capital. Coworking spaces are mitigating this problem. Coworking spaces usually offer up desks, internet and other office amenities for less than $100 a month. They are a niche market at this point, but could soon be integrated into mixed-use complexes or residences. 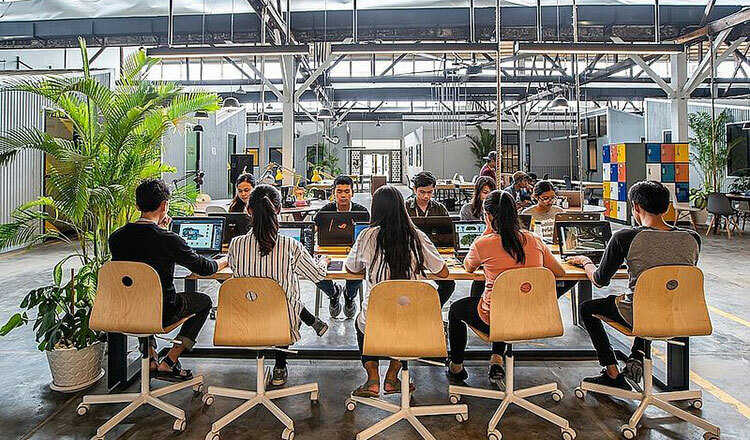 Melanie Mossard, director of venture support at Impact Hub, a socially-minded coworking space, said the group was mainly focused on building a community to inspire, connect and support Cambodian youths. “Our community is mostly made up of those who have joined our incubator and entrepreneurship programmes. Ninety-three 192 entrepreneurs are Khmer. They tend to be students or recent graduates under 30,” she said, adding that access to capital and proper business communication skills were two big obstacles for local entrepreneurs. There are coworking spaces in the capital that already offer a huge cross-section of different options. Factory, a huge complex on the south end of the city, is set up in what used to be an industrial space. “Sixteen buildings make up Factory. Businesses here range from legal services and a marketing firm to a company doing high-end augmented reality for real estate … In other parts of the campus we have a woodworking factory, a skateboarding-focused NGO and Fly Phnom Penh, the country’s first trampoline park,” Mr Hix said, adding that the population of the complex was around 600, 70 percent of which were local firms. Siem Reap, has also seen coworking spaces flourish over the past few years. However, the spaces here seem to blur the line between business and hospitality. AngkorHUB, for example, offers both coworking space and accommodation. It mainly targets digital nomads, those who work remotely while travelling. Jeff Laflamme, the founder of AngkorHUB, said that coworking spaces are still a foreign concept in Cambodia. Many people, he said, would rather work in a cafe for the price of a drink. Chou Samnang, the manager of Siem Reap’s BioLab, a cafe and workspace, said some entrepreneurs depended on tourists for business. They then suffer during low season, he said. It’s no surprise that coworking spaces still have to compete with the vast number of coffee shops in the Kingdom. Amazon and Coffee Today, both Thai-based cafe chains, have a combined total of over 150 locations in the country.